LJ's reviewer dubbed Aidoo "unusually gifted and creative" when praising this collection of 11 short stories. The aggregate theme of the work is the conflict between traditional rural customs and modern urban Westernized culture. This remains "highly recommended for its literary quality" (LJ 7/71). 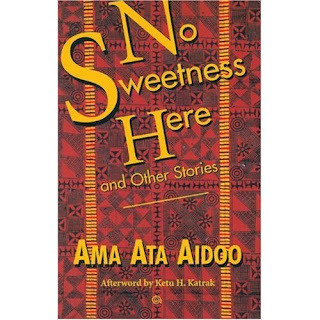 No Sweetness Here, Ama Ata Aidoo's early volume of short fiction, is now available in the U.S. Set in West Africa, these stories chart a geography of consciousness during a period of transition from a colonial society through independence into a postcolonial world still in progress today. The characters-as many men as women come alive on these pages-enjoy good fortune and suffer pain in a tradtional African manner: through brilliant, witty, defiant, image-laden speech. The style of these stories renders African orality dramatically; characterization emerges as much through the unique voice as through physical appearance. The special strength of these stories lies in Aidoo's sensitivity to men's as well as women's lives. Sometimes one can feel even more compassion for the men who are often set in ways counter-productive to living in an African-controlled but tightly-hierarchical society. Even the most critical consciousness-the Western-educated African living abroad or returning home-sometimes doesn't "get it," for the changes are too vast, the future too uncharted. The title story suggests more than meets the eye. If there is no "sweetness," there is the salt essential to life, even if it comes from tears, and the strength that comes from a history of endurance. There is also the wit of the word and the compassion of family and friends. The volume is at once entertaining and deeply instructive not only about a changing Africa, but about such universal themes as love, marriage, work, family, sacrifice, privilege, and hierarchy. Ama Ata Aidoo is a native of Ghana, West Africa, where she has been Minister of Education and an activist for human rights, women's rights, and African unity. One of Africa's most distinguished writers, she is the author of fiction, poetry, drama, essays, and political and cultural commentary.